Lindisfarne co-founder Simon Cowe has died after a long illness, the band have confirmed. 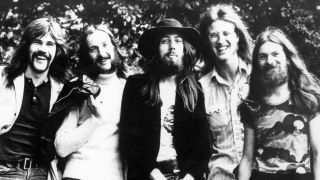 He was part of the lineup formed under the name Brethren in 1968, and played guitar, mandolin, banjo and keyboards until his departure in 1973, when he formed Jack The Lad with colleagues Rod Clements and Ray Laidlaw. Cowe rejoined when the band reactivated in 1976, then again in 1978, and remained until 1994. He became a master brewer in Canada. Lindisfarne say: “Simon had been ill for some time and was being cared for in hospital in Toronto, a city he had made his home since the early 90s.